Home Blogging tips Which keywords should I use? I have a new smartphone ~ Samsung Galaxy S II. It is a great phone but bad compare to HTC HD2 in SEO term. Why? The official Samsung Galaxy S II keywords does not always return the search result that I want. Samsung Galaxy S (SGS1) results were returned some time. Therefore, I used Google Trends to check its search volume. 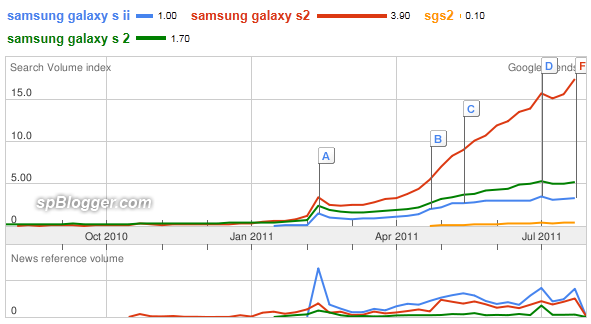 Based on Google Trends, Samsung Galaxy S2 is the most frequent search keywords compare to official Samsung Galaxy S II keywords. So you know which keywords should I use now? Next articleHow to recover from Google Panda Update? Which Google AdSense Keywords pay higher?